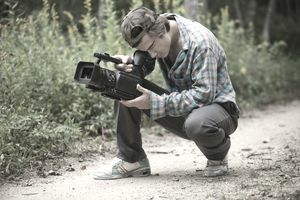 Whether you aspire to become a media videographer or just want to know how to shoot professional-looking videos, you need more than good equipment. Mastering several basic video tips will ease the frustration many videographers' experience. Before long, the standard tricks will become so routine that you'll be able to concentrate on creativity and not just the basics. A tripod is an easy answer to producing steady video, but avoid becoming dependent on it. You can shoot steady video without lugging around a lot of gear. Get your body in position so that every breath you take doesn't lead to unwanted camera motion. Use the ground, a wall, or another object to brace the camera and get interesting visual perspectives. By ditching the tripod, you can move around a scene without being anchored in one spot. Producing interesting videos involves learning creative shooting techniques. You don't want your videos to look as though they came from a surveillance camera. A beginner tends to shoot everything from the corner of a room or away from the action. By putting yourself in the middle of what's happening, you will get images that aren't possible from a distance. Experiment with different angles by shooting above and below your subjects. Videos are trending toward widescreen formats, such as a 16x9 ratio. Think of how you can make this extra visual space work for you. You can capture much more content in a single shot, but remember that widescreen video doesn't mean shooting all wide shots. Television is still an intimate medium. Close-ups of faces will convey more emotion than a group shot of a crowd. Picking up a camcorder for the first time has just about everyone wanting to hit the zoom button on every shot while panning across the horizon. The result can leave viewers seasick. If you're recording an action scene, let the motion that's happening naturally dominate your video. Stop yourself from adding random zooms and pans, which distract from the action. Make sure there's a reason you are zooming or panning. At a sports event, professional videographers follow the action by following the ball. That's the motivation behind tilting the camera up when a baseball player hits a fly ball or panning during a double play. You'd think outdoor videography would be simple because the sun provides the lighting, but to get the best outdoor results, you have to watch the position of the sun closely. Shoot with the sun at your back. If you're recording people, they may complain about looking directly into the sunlight, but tell them that the shots you'll get will be much better than if you were shooting into the sun. That would put their faces in silhouette. Ignoring lighting when shooting indoors can make your videos look dark. That's why indoor video shoots require additional preparation. Adding lights is ideal. If that's not possible, check out the available lighting sources. If you're shooting video of people, get as much light in their faces. But don't be fooled by overhead lights. While they may be bright, they only light the tops of people's heads, leaving their facial features shadowy. Using television lights will give your videos a crisper look. But good lighting involves more than blasting your subject with as much wattage as you can find. Knowing where to position lights makes all the difference in getting a natural effect versus making people look as though they're about to undergo surgery. Besides a standard 3-light setup—one directly on the subject, plus a backlight and a fill light—experiment to get dramatic effects. Turn out all the lights in a room and use only your equipment to highlight what you want. At some point, you'll want to shoot video of a person talking into the camera. It could be a sit-down news interview or just a conversation with a person on the street. Plan the interview shoot to deliver professional results. Consider the background. If you're talking to someone about traffic in their neighborhood, show cars in the distance. If you're interviewing a father about the day his child was born, put him in a cozy setting, like near a fireplace. Then decide how tight you want to shoot the interview. There is the standard head-and-shoulders look, but you may want to interview a farmer on his tractor with much of the tractor in the shot. A highly emotional interview should be shot tight so that you can see into the person's eyes. While capturing compelling video, don't forget that good audio is a must. Otherwise, your video may turn out useless. The two most common mistakes are to forget to record audio and to fail to monitor the sound you're getting. Forgetting to record audio means a child's birthday party is silent. You may be able to see the other children singing and laughing, but without hearing it, the video is ruined. Monitoring the sound helps you avoid recording unwanted audio. That can happen when you interview someone and don't notice that you are standing near a loud air conditioner. When you watch the video later, all you hear is the hum of the A/C unit, which drowns out what the person was saying. Using a chromakey green screen gives you a world of options. These are the same tools TV stations use to present the weather. A meteorologist stands in front of a green screen, which allows the weather maps to be superimposed behind him. You can shoot a person remembering her high school graduation while video of the graduation plays behind her. It's an easy way to combine two video sources into one shot.